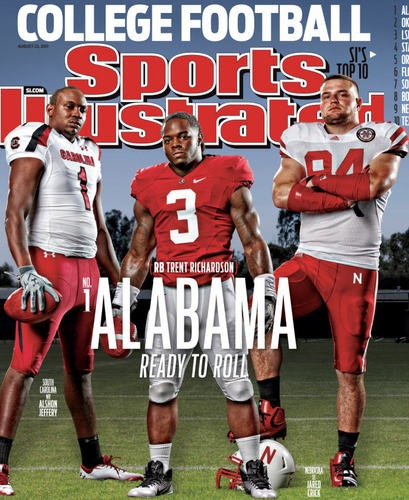 TUSCALOOSA, Ala. — Alabama’s Trent Richardson wasn’t a starter when he arrived on the scene. He was biding his time behind tailback Mark Ingram, who was on his way to becoming Alabama’s first Heisman Trophy winner. But Ingram knew long before Richardson was selected as a finalist that the Crimson Tide might have another candidate waiting in the wings. Then a freshman, Richardson broke four tackles en route to a 52-yard touchdown against Arkansas two years ago in a run that has only grown in the retelling. A program that collected – by its own count – 12 national titles before fielding a Heisman winner now is hoping for its second in three seasons. Because of Ingram’s looming presence, Richardson was a star long before he was a starter. Compact, powerful and with a sprinter’s burst, Richardson joins LSU cornerback Tyrann Mathieu, Wisconsin tailback Montee Ball and quarterbacks Andrew Luck of Stanford and Robert Griffin III of Baylor as finalists for this year’s Heisman, which will be presented Saturday in New York. Alongside Ingram, his former backfield mate now with the New Orleans Saints. Richardson picked up where his predecessor left off, powering the Tide’s offense into a national title shot Jan. 9 against LSU. Since Archie Griffin won his second straight in 1975 for Ohio State, only Southern California has had two Heisman winners in a three-year span: Charles White and Marcus Allen (1979, `81) and Carson Palmer (’02) and Matt Leinart (’04). Richardson has run for 1,583 yards and has 20 rushing touchdowns and three as a receiver. Not bad for a first-year starter, who never let on publicly if he minded running in second place for two seasons. His handling of that situation endeared Richardson to teammates. “The first word that comes to my head when I think of Trent is `teammate,’” Alabama left tackle Barrett Jones said. “He really is the ultimate teammate. Not many guys would have had the attitude he had these past two years. Probably would have started anywhere else in the country just with the talent level he had. Richardson said he “just really had to humble” himself. He still racked up 1,451 yards and 14 touchdowns – and two Sports Illustrated covers – before becoming a starter when Ingram left for the NFL, another move that Richardson soon could duplicate. The 5-foot-11, 224-pounder has gotten plenty of attention for his weight room prowess – Tide coaches limit him to 475 pounds on the bench press and 600-pound squats – and ability to steamroll defenders or carry several for extra yardage. 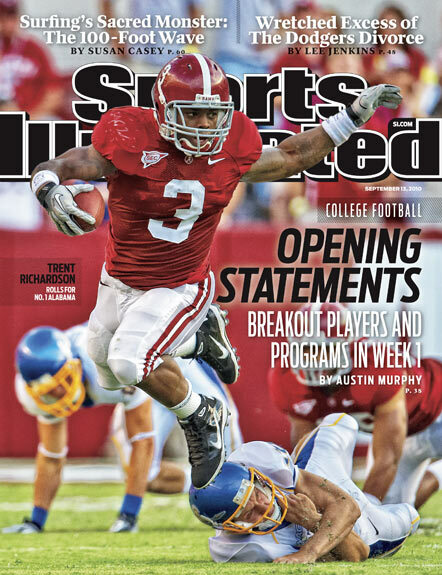 Despite Richardson’s physical style, coach Nick Saban scoffs at labeling him a “bruiser”. “You’re talking about a guy to me that shouldn’t be pigeonholed into a guy that is a bruising back because to me he’s so much more,” Saban said. “He’s a great leader on our team. He’s a hard worker. He sets a great example. He cares about the other players on the team. He’s certainly a very, very productive, competitive guy who has been probably as good a player as I’ve ever had the opportunity to coach in terms of the whole package. momentum and straight-armed a defender on the sideline then raced across the field for a 57-yarder. Against Mississippi, he shed two tacklers, cut over to the right sideline and stopped short to shake one defender around the 10 before sprinting to the end zone to punctuate a 76-yard run. Richardson also had a solid overall effort against No. 1 LSU. He ran 23 times for 89 yards and had five catches for 80 yards. Richardson’s nine 100-yard rushing games ties Ingram for the school record. He’s only 75 yards shy of the Alabama mark set by Ingram two years ago in one extra outing – the Southeastern Conference championship game. Richardson is also a finalist for the Maxwell Award as player of the year and the Doak Walker Award given to the nation’s top running back. The lone drawback to all these awards: Flying. The back that fearlessly smashes into 230-pound linebackers can’t stand it. Richardson, Tim Tebow and Cam Newton are the only SEC players to rush for 20 touchdowns in a season, and those two quarterbacks are Heisman winners. Alabama has cited the quality of defenses Richardson has faced in promoting his candidacy. He has faced eight defenses ranked among the nation’s Top 51, and the school says no other Heisman contender went against more than five. The thickly-muscled Richardson doesn’t hesitate when asked about what drives him: Daughters Taliyah, 5, and Elevara, 3, and his mother. He says he is “just happy to be out there making everybody smile,” but especially them. If it sounds as if Richardson’s looking ahead to the NFL and following another Ingram move by skipping his senior season, he says that’s not necessarily true. He said his heavy course load – 15 semester hours – this fall leaves him just two or three credit hours from graduating. “I’ve come this far on my degree, so I don’t know what I’m going to do yet,” Richardson said. “After this game, I’m going to sit down with coach and talk about it and sit down with my mom. The league isn’t going anywhere.